How often do we get stuck dwelling on things that have happened in the past? Good or bad. And so many times we miss what God is trying to do now, today, because either we want to bask in the victories we have enjoyed, or continually beat ourselves up over perceived failures. It’s interesting in this part of Isaiah that God talks about forgetting the past right after He has finished reminding the children of Israel of all He had done for them including the parting of the Red Sea. So the message here is not that the things He has done for us in the past are unimportant, but instead I believe God is urging us not to confine Him just to the things that He’s already done. How incredible it is for us to know that God is continually telling us to keep our eyes pressed forward because something new, something big, is springing up in front of us each day. And if we’re not careful, we might miss it. Because, in all honesty, when God says He is going to do a new thing, the truth is that He is already in the process of doing it…He’s just giving us a chance to join in! In June, we became the Sparrow Village. Along with that came a renewed vision and mission for our ministry. As Roxanne and I began to individually and collectively pray and seek God’s direction, He was continually stressing three themes to us: Rescue, Health, and Jesus. The rescue part was something we were already doing through the houses and families on site, but the difference was the sense of urgency that we felt God stressing to us. Two houses and seven foster children are great, but we know He can use us and this property to rescue more. 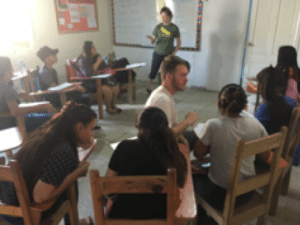 Now, recruiting and finding foster parents willing to pack up and move to a rural area of Honduras is not necessarily an easy task, but God tells us that he will make a way in the wilderness. So even though I can’t see it or even fathom how it will happen, I can have confidence that He already knows and is already working. Another thing we want to do is use the gifts and wisdom that God has given Roxanne to help with this idea of improving the health of families in the communities around us. We began ask God how He could use the Sparrow Village to encourage parents and families and help preserve family unity as much as possible in our area. We believe He showed us that the answer lies in education and discipleship. Part of that means working with expectant mothers in our community and the areas around us. Additionally, Roxanne will be traveling to Dallas in October to receive further training on helping families with children who have experienced trauma. She has felt God leading her to go through this training for some time now in order to equip the people who care for these children (parents, caregivers, teachers, medical professionals, social workers) with the knowledge and tools needed to help them heal and maneuver in the world despite what trauma has done to them physically and emotionally. In the past, the cost of the training has always kept us from signing her up in the past, but we knew we needed to trust God for this. In faith, she went ahead and signed up for the classes this Fall. Just as a testimony to how God again made a way in the wilderness, she received a $2000 scholarship and we also received a few donations while we were in the US recently. As of last week, we were about $800 short of what was needed. We posted a separate donation request last week for a new generator as ours had stopped working. We asked for $900. By the end of the day, God had brought in $1700 for the generator. Now, I’ll let you do the math there, but suffice to say that God not only provided for that need but He also answered the need for additional money for the training as well. He made a way. The last part of our mission is to simply let folks know that Jesus is the source of healing for every struggle in our lives. Whether we are working with our foster children, the folks in our community, or one of the other ministries that we are connected to, we will be failing if we do not point those we encounter directly to the One who can bring healing in their lives. One way we plan to do this is by very soon starting a weekly Bible study for folks in our community on Sunday afternoons. There are many people just in our neighboring community that have been seemingly cast out from the church and are hungry for fellowship, discipleship, and the opportunity themselves to serve. Call it a small group, call it a church, or call it whatever, it will be a family of people striving to grow stronger in our walk with God together. Even now, we believe God is making a way for this to happen. For all of us, there is a wilderness or desert standing before us and the new thing that God has set out for our lives. So how will you respond? Will you be caught dwelling on the past and completely miss the new thing that God has laid out for you, or will you “perceive”, or “embrace”, that calling and let Him make a way? What is the wilderness in your life? The only thing I can say with confidence is that God will always make a way and that He will provide those streams we need for strength and to sustain us along the journey. That’s what He promised after all, right? Maybe taking a new road the Lord puts before you means doing something that scares you rather than the safe and expected alternative. Maybe it means stepping out of those comfort zones and letting God be glorified through your weaknesses. Regardless, He is calling us to open our eyes and see that “new thing” that He is doing and join Him in it. He will make a way because He alone is the Way. By taking heed to Isaiah 43:18-19, we will always be ready for whatever comes next. As a result, we can rest in the knowledge of three things. That God has done some pretty great things. That He is just getting started. And, finally, that you ain’t seen nothing yet! Mount Olivet, for a week here in Honduras. It is always a special time for Dean as he gets to serve alongside both his immediate and church family. 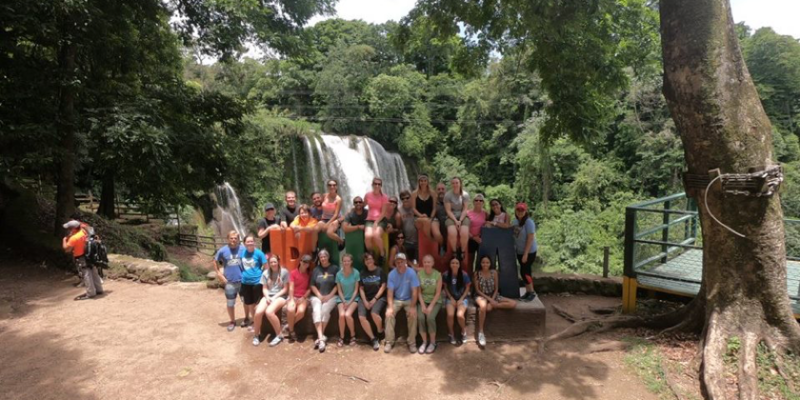 Amazing things happened that week as we saw my new office get built, new sewing skills developed, and new relationships developed that will last a lifetime. I am so appreciative of the work the team put into my office as it will be such a blessing for years to come. Another thing that really blessed the Sparrow Academy was the help we received with a struggle that was happening within the classroom. Behavioral problems had been something our teachers really needed help with. So, a few months back I talked with my sister-in-law, Julie, and asked her to prepare a training to give the teachers when she comes down, knowing that she was gifted at working with special needs students. Little did I know, God had also chosen Amanda, an elementary school teacher, and Emma, a psychologist, to join her in tackling this issue. After spending only one morning in different classrooms, they all quickly reached the same conclusion and created a plan that will reinforce positive behaviors in our school. I’m so exited to see the results of this and the effects it will have in the kids of our school. This is a perfect example of what Paul talks about in I Corinthians 12, when he says we are the same body but made with many parts. So, they all have to function in their different ways to make the body work. I like in particular the verse 27 “Now you are the body of Christ, and each one of you is a part of it”. This week we all came together as the body of Christ, the teachers helping at school, the builders working at the new office, the sewing ladies teaching how to sew, and ladies and guys helping with women and children sharing their testimonies. What a beautiful picture of the body working all together for one main goal: to bring God glory. I want to share a little bit with you about what God is doing here in Santiago. One of the ministries God has me pouring my heart into right now is the Sewing Clinic. Every Wednesday, I spend the day with some lovely ladies from our community, and we sew and laugh and grow together. And on Mondays, Roxanne facilitates a bible study for us all. Each week, as we sit in a circle and discuss what God has spoken to each of our hearts, we are given opportunities to grow and disciple each other, and it has truly been beautiful. One of the ladies from our sewing clinic, Oneyda, has given me permission to share a blog about how thte sewing clinic has changed her life. Last year when the sewing clinic started, Oneyda was incredibly interested because sewing has always been a dream of hers. She came the first day very very excited, and immediately, she stood out as someone who was truly talented. But what made her stand out the most was the way she grasped a new skill and then helped all of the ladies around her to understand as well. From the very first day, we knew she would be integral to the sewing clinic. Fast forward again to January 2018… Chris and I planned a trip to the states, and it is Micah’s first time meeting a lot of our family. We planned a few fundraising events and told the ladies that if they had a few bags made before we left, we could bring some with us to sell at these events. 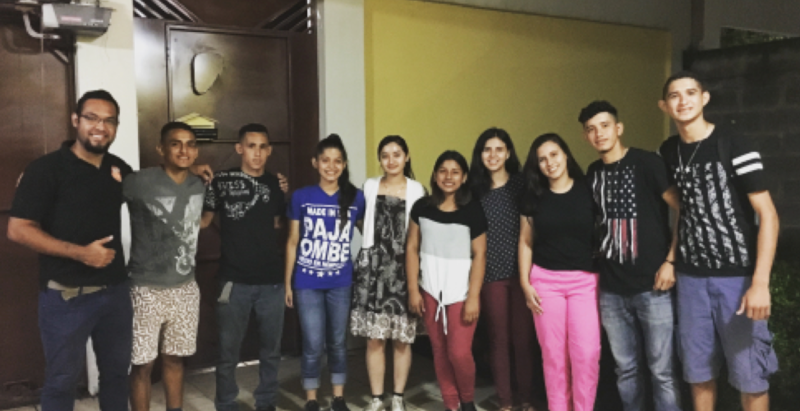 We thought maybe they would make a few things… These women worked night and day, and we took back almost 250 bags, purses, and backpacks to sell!!! And we sold almost all of them. By the end of our visit, Oneyda had sold enough to pay for everything she needed to run electricity all the way up the mountain to her house. By late February, Oneyda had electricity in her home! And she was even able to buy some of the supplies she will need for a bathroom! Lately, Chris and I have been discussing how we could sell more of the ladies’ product and help provide specifically for Oneyda so that she can build a bathroom in her home. We decided we would pray that God opened doors, maybe through teams purchasing their products, or maybe He had different plans. 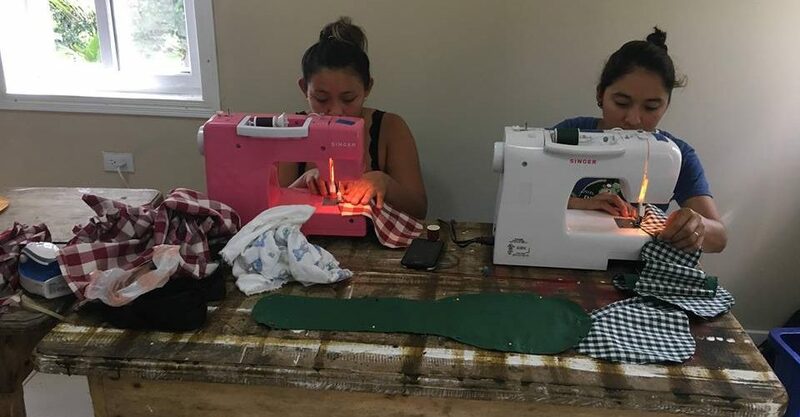 Just a few days later, Justin proposed an idea… What if our sewing clinic made ukulele bags to sell with the ukuleles they are making in San Pedro?! So our ladies went to work creating patterns and prototypes until they got it just right! And just like that, God is answering our prayers! 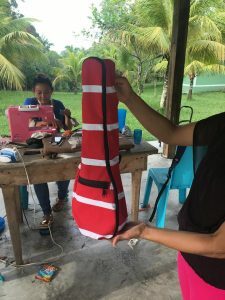 We are selling amazing quality ukulele bags, and our ladies all feel so encouraged that God is always providing for them! Please praise God with us for all of the ways He is blessing our ministries and LITERALLY shining light to penetrate the darkness. Our God is so good! 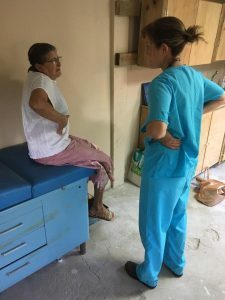 I want to share the testimony of how the medical clinic came to be, starting from the very beginning. God knew about the medical clinic we would open in Santiago, Honduras long before I ever dreamed of it and He’s been guiding me to this place almost my whole life. My aunt Wilda won an award for being an amazing nurse when I was small. Her work ethic and recognition of a job well done obviously impacted me greatly, because my mom and dad tell me that from that day forward, I wanted to be a nurse. Fast forward to junior high and high school and I got a little afraid of giving people shots, so I changed my desired career to teaching. As only God can do, He made it clear to me that nursing was where He wanted me. I was still unsure of how in the world I could ever hurt someone on purpose, but I trusted that He knew what was best for me. I was accepted to the same nursing school my aunt Wilda graduated from and waited to see where this new future would take me. In nursing school, I always wanted to be a labor and delivery nurse. I couldn’t imagine a better job than helping women bring sweet babies into the world. God had other plans and had me do my clinical practices in Cincinnati Children’s Hospital. It was my second choice. I applied for jobs on the labor and delivery floors of a few hospitals and a medical-surgical floor at the Cincinnati Children’s Hospital. I’m sure you can guess where I got a job- the children’s hospital. I loved working with children. They were sweet and fun and they almost always left my care with no real risk of returning. Their illnesses were generally not chronic and so their future looked bright. I loved working with children, but still felt like working in labor and delivery would be even more fun. When I married Eric, I tried again to get a job on a labor and delivery floor, to no avail. I was able to get a job at the Kentucky Children’s Hospital. My attempt to become a midwife was thwarted by high tuition costs and a school that was hours away from our home. Once again, I trusted God’s guidance in my life and became a pediatric nurse practitioner instead. God knew before I was born what His future was for me. He knew my future held Honduras, that I would be working with children and that I would live in a community that needed medical care. Isn’t it so amazing? He is smarter, more loving and more powerful than our minds can imagine. 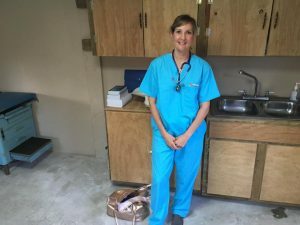 The medical clinic has been a dream for the Sparrow Missions Children’s Home from the very beginning. I knew God had allowed me to become a nurse practitioner and get a doctorate degree, so I also knew I needed to use that knowledge to serve Him. When I practice medicine, I feel God’s hand guiding me and leading me. I feel close to God when I am caring for people, whether it is in the hospital or in a general practice office. He gives me insight and understanding about the person’s condition and many times about their struggles. I am more than happy and proud to be allowing God to use my hands to bring healing to His precious creation. Please continue to pray that God gives me wisdom as I care for the people here in Santiago and that I continue to listen to His guidance.